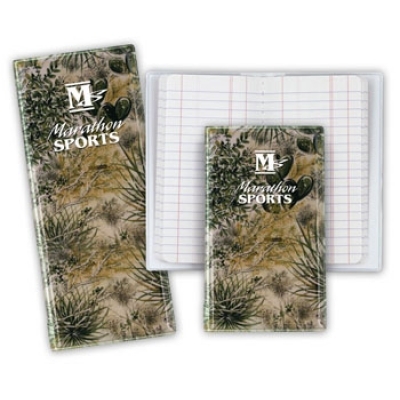 GameGuard™ camouflage pattern on a full size tally book. Southwest Texas flavor. Exclusive design! This tally books shows the popular GameGuard™ camo pattern from Southwest Texas. The crisp clear image is made possible by our own "color rich" process. Price includes sewn pad, vinyl cover, with your 1 color imprint superimposed on our vibrant full color design.